When a visitor comes to tour our plant, we have traditionally given 1952 as the beginning date. But for the full story, we'd have to go back a bit farther. Mr. Burger cured hams using a mixture of salt, pepper and brown sugar. At this point, most people wonder how he grew a business using ingredients readily found in a pantry. But what you might not know is that his most prized ingredient was patience. Mr. Burger had bagged, cured and aged his first hams himself, in accordance with the ancient principles his mother passed down. In that first year, he sold six hams. The next, he sold 12. And in the 1930 , E.M. married his wife, Natalia. Together they cured and sold 24 hams. 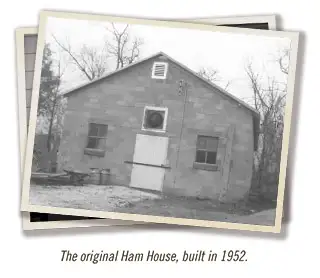 Their small business grew steadily over the years, and in 1952, the first Ham House was built on the family farm. It was a one-room building overlooking the Moreau Creek three miles south of California, MO. Farming was the family’s primary occupation, so most of the ham work needed to be done at night. But with persistence, patience and many overtime hours without pay, they cured 1,000 hams. The neighbors called them crazy. The idea of selling even close to that number was unheard of. Proving the doubters wrong, Mr. Burger readily found markets for his ham. He built an established clientele of restaurants and individual buyers. It turns out; the problem wasn’t the ability to sell. It was the ability to keep up with demand. So in 1956, he curtailed his farming activities to devote more time to the ham business and outline an expansion program. That year, his business became the first country cured meat company in the United States to receive federal inspection. Mr. Burger’s little business has proven successful. 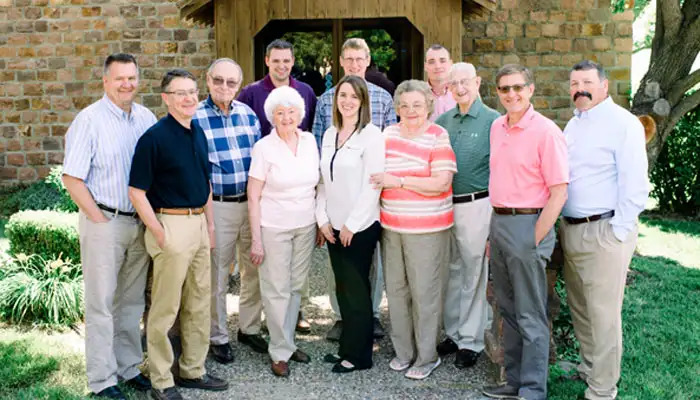 Today, Burgers’ Smokehouse remains owned and operated by the third and fourth generations of the Burger family. And the very first ham house still remains a part of our plant complex. Over the years, we’ve expanded our line to include a variety of proteins, cheeses and desserts. And while we’ve grown quite a bit since our humble beginnings, we like to keep our methods true to simpler times. The thing most people find truly surprising isn’t that our business started with six hams and the most basic ingredients. Rather, that the recipe has hardly changed since those original six hams.